Represented IIT Madras (only team from India), at FIRA 2012, Image Processing Based Robot soccerr competition/conference, in a team of 10 members, as a part of the Image Processing team. Developed the visual processing Interface using OpenCV libraries. Images were processed at speeds of upto 100 frames per second to track the robots and ball through live streaming from an overhead camera (bird’s eye view). Football strategy algorithms, using the data generated by the visual processing, would make a decision on the movement of the robots which would then be wirelessly transmitted and executed. This was a great learning experience at an international competitive platform. 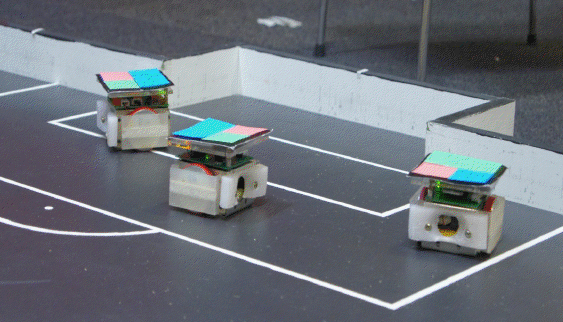 Three colored tiles were used on the top surface to detect unique id and orientation of 5 bots. Each part of the robot was manufactured by the team.